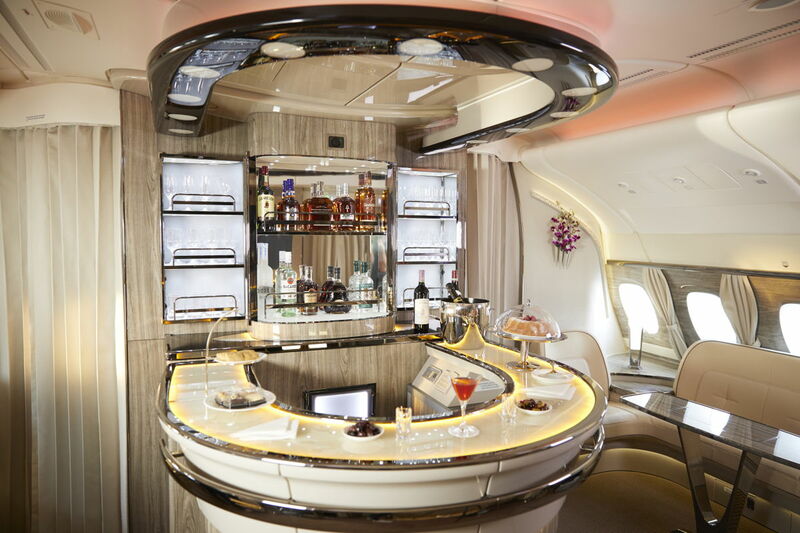 Emirates has refreshed its spirits offering across all classes with a range of premium brands. Spirits on board are served complimentary across all classes and routes. Dubai, UAE, 2018-Apr-13 — /Travel PR News/ — Emirates has refreshed its spirits offering across all classes with a range of premium brands. Spirits on board are served complimentary across all classes and routes and include a range of whiskeys, cognacs, gins, vodka and flavoured liqueurs amongst others. The new selection was made by an in-house team of experts who spent two years working directly with suppliers to curate the brand new spirits offering. Emirates has invested in long term partnerships with some of the world’s best brands resulting in the finest spirits as well as exclusive selections available on board. Emirates’ new spirits menu is an extensive offering of over 30 new spirits and liqueurs served across all classes. The spirits complement Emirates’ world class offering of over 80 fine wines and champagnes served across its network daily. “We aim to deliver the best culinary experience on board and that goes for our menus, our wines and also our new spirits range. We’ve invested time in building relationships with the best spirits makers in the world, understanding global trends and achieving the perfect serve on board to showcase these beverages in the best possible way,” explains Joost Heymeijer, Senior Vice President, Inflight catering, Emirates. The new spirits menu on board includes a mix of niche, hand-crafted brands as well as popular and well-loved spirits such as Hennessy cognacs in all classes including the exclusive Hennessy Paradis in First Class and for a limited period on select routes the extremely rare Hennessy Paradis Impérial. The new menu was launched with a special cognac tasting held at the Emirates A380 Onboard Lounge on a flight to Paris last month. The first-of-its kind masterclass at 40,000 feet was led by Mr Alfred Tesseron, owner and Chairman of Tesseron Cognac. Tesseron Lot 29 XO is a niche, hand-crafted cognac that scored 100 points by celebrated wine critic Robert Parker, and is by a brand that is centuries old and still family owned. Other brands served in First Class include the Dalmore King Alexander III, the only single malt Scotch whisky in the world created using a unique six-cask finish; Belvedere luxury vodka; Johnnie Walker Blue Label Scotch whisky and premium Guatemalan rum, Ron Zacapa Centenario XO. In Business Class and at the iconic Emirates A380 Onboard Lounge, customers can enjoy Glenfiddich Solera Reserve 15 year old single malt Scotch whisky, small batch premium bourbon Woodford Reserve Distiller’s Select, craft gin Sipsmith, and more. Other spirits available in Economy Class include Dewar’s White Label Scotch whisky, Beefeater gin, Russian Standard Original vodka, Jack Daniel’s Tennessee whiskey and Bacardi Carta Blanca rum – the world’s most awarded rum. Emirates is also serving regionally focused beverages such as Amarula, a fruit cream liqueur available in all classes. The liqueur is made from Marula fruit which grows wild and uncultivated in South Africa. It is then fermented and the Marula ‘wine’ is distilled and aged in French oak barrels for at least two years. In conjunction with its new spirits offering, Emirates has also refreshed its cocktail menu by adding the Negroni, Old Fashioned and Aperol Spritz while retaining some of its most popular orders on board such as the classic Bloody Mary, Mojito and Kir Royal. In Economy, Jack Daniel’s whiskey is the most requested drink from Emirates’ list of spirits. In Business, Sipsmith gin takes the top spot, while in First, the most popular spirit requested is the Chivas Royal Salute whisky which is aged for 21 years.